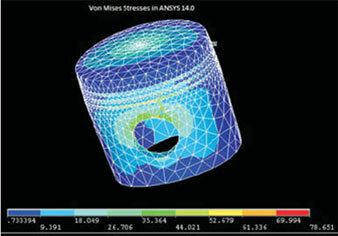 The piston model was analyzed through structural analysis to obtain stress and deformation values. Based on the design, the piston geometry was optimized keeping the stress and deformation within the permissible range. Engine piston is exposed to large amount of pressure forces generated through the combustion of fuel inside the chamber. These high magnitude forces cause the piston to move downwards and also produce stress within the geometry. In modern automobile engines, where downsizing is of prime importance, there is a room for this component to be re-designed with optimized dimensions. An auto parts manufacturer in Asia Pacific region needed similar solution to propose a new piston design, optimized to provide similar strength but with reduced volume, allowing considerable cost savings. The piston geometry developed through CAD tools was utilized to evaluate the structural integrity through finite element analysis. 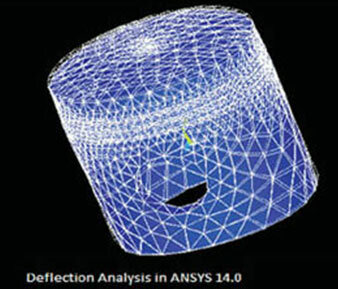 The results obtained through the analysis were utilized to optimize the geometry further to reduce its volume, while ensuring that the stress values remain within the permissible range. The final analysis after design optimization showed that there was a slight increase in stress and deformation with a decrease in volume. However, these values were well within the allowable range, testifying the feasibility of the proposed design.